Toronto mayor Rob Ford took a few hours off from not working to watch Canada prevail in the women's hockey gold medal game. 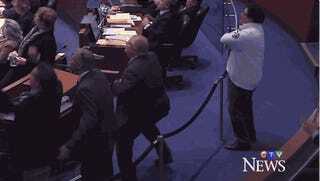 This is the moment of victory at Toronto City Hall. For as bad as you may feel for the American players, save your sympathy for Ford's knees.